and J & D Fertilizers, LTD.
WSDA and CDFA certificates are available upon request. 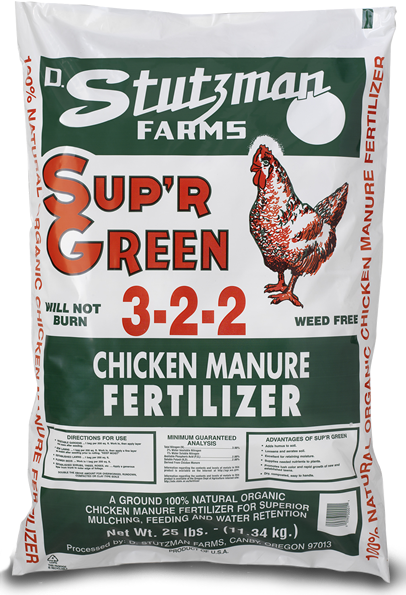 Sup'R Green Chicken Manure, Nutri-Rich 4-3-2, and Nutri-Rich 8-2-4 are available at many independent farm & feed stores and garden centers throughout Oregon, Washington, Northern California, Idaho and Hawaii. For bulk or private label inquiries please contact us direct at 888-877-7665 or email us at stutzman@canby.com. and J & D Fertilizer, LTD. Copyright © All Rights Reserved by Stutzman Environmental Products, Inc. and J & D Fertilizer, LTD.